How does one transform a physical object into a digital version? There are so many app versions of toys and games that make them easy, private and portable, you wonder how you ever played them in their table-top version. The Monopoly and Game of Life Apps, where once you had 100s of pieces, you get the same results and story through a different experience. The challenge this week was to transform our physical counting devices into their app version. I created a small box based on the abacus and tally marks, called the AbacusDabra. 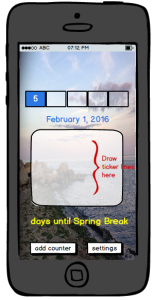 Whether counting up to or down to something, user’s put up a tally mark each day. When it reaches 5, they spin a block to display the latest numerical value. 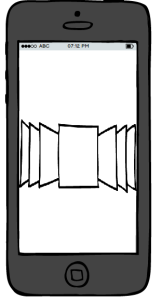 They can also use the device as a photo frame for inspiration to the story they are conveying to themselves with the device. Transforming this into and app, while keeping it’s central features was a fun task. How can it remain interactive yet a 3 dimensional space at the same time? AbacusDabra begins with a typical start screen that, if this is a return user, will filter automatically into a personalized greeting. This is where the user enters in what they are counting. 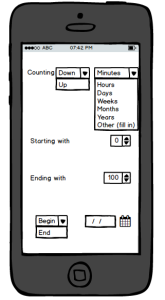 The user can choose whether or not they are counting up or down, and the specifics of time they are counting. There is an option for OTHER that can be filled in if the user is NOT counting time. 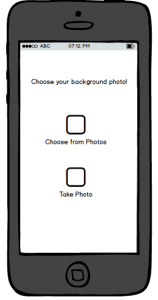 They are also able to choose a background photo. Once they choose it will automatically bring them to their counter page. In the center screen they draw the tally marks with their fingers, manually. 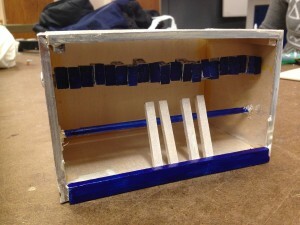 Once the fifth line is drawn, the abacus-like boxes on top will adjust to the according multiple of 5. 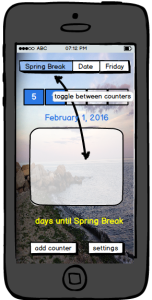 At the bottom of the screen, the user has the option to add a new counter. They can toggle between the counters on the top bar. They can also go to settings and update the current counter that they are in by clicking settings at the bottom. This should be a simple and effective way to bring the physical AbacusDabra into the digital world. It’s crazy to believe that IDEO has been around for 35 years and UX has been a “thing” for that long, sitting quietly (yet with impact) under the radar. I would be very curious to see the different prototypes that led them to the stand-up toothpaste design (other than these). I wonder why we don’t see marketing for these as much as the regular tubes anymore.